A powerful little helper. Google Home Mini keeps you informed and up to date with instant news, weather and commute updates without lifting a finger. Master the kitchen: Google Home Mini helps with timers, step-by-step recipes, and conversions and substitutes. Start your smart home: it's always improving with seamless connections to the latest compatible smart lights and thermostats. In two unique colours: chalk and charcoal, pick a Google Home Mini to match your room and personal style. Get hands-free help in any room. Google Home Mini is powered by the Google Assistant, so that you can ask it questions and tell it to do things. By using your voice, ask for things like translations, calculations, nutrition information and unit conversions, or other information. Just start by saying, Ok Google. Plus, get help managing your schedule, from breakfast to bed. Play, pause and rewind. Control compatible entertainment hands-free from the comfort of your sofa. Use with Chromecast so that you can start streaming shows, movies and music on your TV or speaker. And control your smart home, such as compatible lights, thermostats, switches and more from your favourite home automation systems, like Philips Hue, Nest and Samsung SmartThings. A powerful little helper. Google Home Mini keeps you informed and up to date with instant news, weather and commute updates without lifting a finger. Master the kitchen: Google Home Mini helps with timers, step-by-step recipes, and conversions and substitutes. Start your smart home: it's always improving with seamless connections to the latest compatible smart lights and thermostats. In two unique colours: chalk and charcoal, pick a Google Home Mini to match your room and personal style. Get hands-free help in any room. 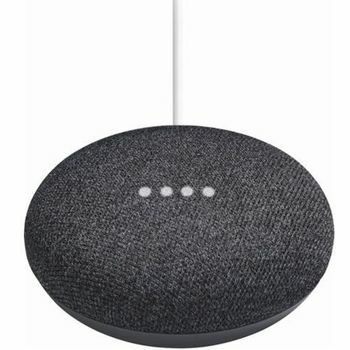 Google Home Mini is powered by the Google Assistant, so that you can ask it questions and tell it to do things. By using your voice, ask for things like translations, calculations, nutrition information and unit conversions, or other information. Just start by saying, Ok Google. Plus, get help managing your schedule, from breakfast to bed. Play, pause and rewind. Control compatible entertainment hands-free from the comfort of your sofa. Use with Chromecast so that you can start streaming shows, movies and music on your TV or speaker. And control your smart home, such as compatible lights, thermostats, switches and more from your favourite home automation systems, like Philips Hue, Nest and Samsung SmartThings.